The Wizard of Menlo Park with his electric light. Image courtesy National Park Service, via World Book, 1977 edition. 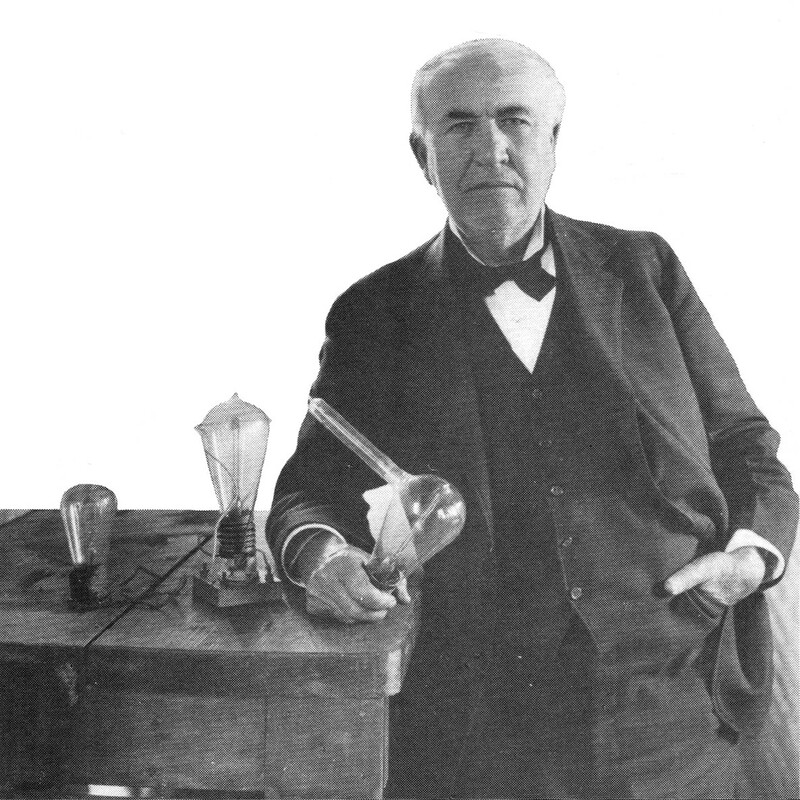 Thomas Alva Edison was born in Milan, Ohio in 1847, and spent his boyhood years in Michigan. As a youngster, Edison was called “addled” by a schoolteacher, and his formal school career ended after a brief three months. Instead, he educated himself, with his mother’s teaching and visits to the Cooper Union in New York City. He began his professional career as a telegraph operator, and through that work began to develop innovations related to that field. Settling in Menlo Park, New Jersey in 1876, Edison produced countless new inventions and practical improvements on existing inventions that would have great effect on the lives of people all around the world, including the practical electric light bulb, the motion picture camera, direct current (DC) electrical systems, and, most important to this website, the phonograph. As an aside to the DC power, Edison’s position against alternating current (AC) electricity led to his development of the electric chair to prove how dangerous AC power could be. By the end of his life at the age of 84 in 1931, Edison held 1,093 patents in his name. In the phonograph industry, Edison began in 1877 with his recording and playback of “Mry Had a Little Lamb” on a tinfoil cylinder. Not long after, his company began selling cylinders and the phonographs used to play them. By the 1910s, disc records began to overshadow cylinders as the public’s preferred medium for sound reproduction, and Edison introduced his Diamond Discs in 1912, requiring an Edison phonograph to properly play the esoterically cut records. 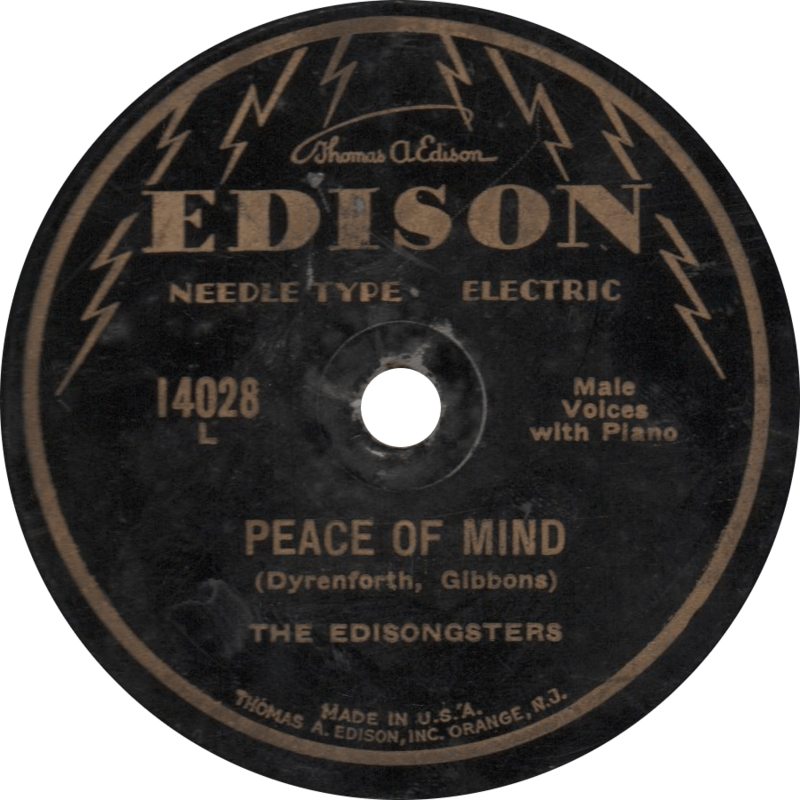 Finally, in 1929, standard laterally cut phonograph records, playable on a Victor or comparable talking machine had far exceeded Edison’s records, and as his last venture in the phonograph business, Edison rolled out a short production of “Needle Type Electric” records, designed to play on regular laterally oriented reproducers, rather than requiring an Edison phonograph. The “Needle Type” discs were identical in form to ordinary 78s, as opposed to the heavy, quarter inch thick Diamond Discs. These “thin” Edisons, as they are sometimes called, were only produced for several months, making them quite scarce today. Edison 14028 was recorded sometime in 1929, I can’t seem to place the exact date or month; if anyone knows it I’d appreciate if you could share it. The Edisongsters, Edison’s answer to the Revelers, consist of Will Donaldson, J. Donald Parker (aka Jack Parker, aka Glen Wick), that versatile Frank Luther, and Phil Dewey. On the “L” side (standing for the side that should face left when the record is stored in a vertical position), the Edisongsters sing “Peace of Mind”. Peace of Mind, recorded 1929 by The Edisongsters. On the “R” side, they sing “I Want to Meander in the Meadow”. I’m sure both these songs are the kind of conservative, restrained, and by all means not “hot” music the old Edison would have approved of. 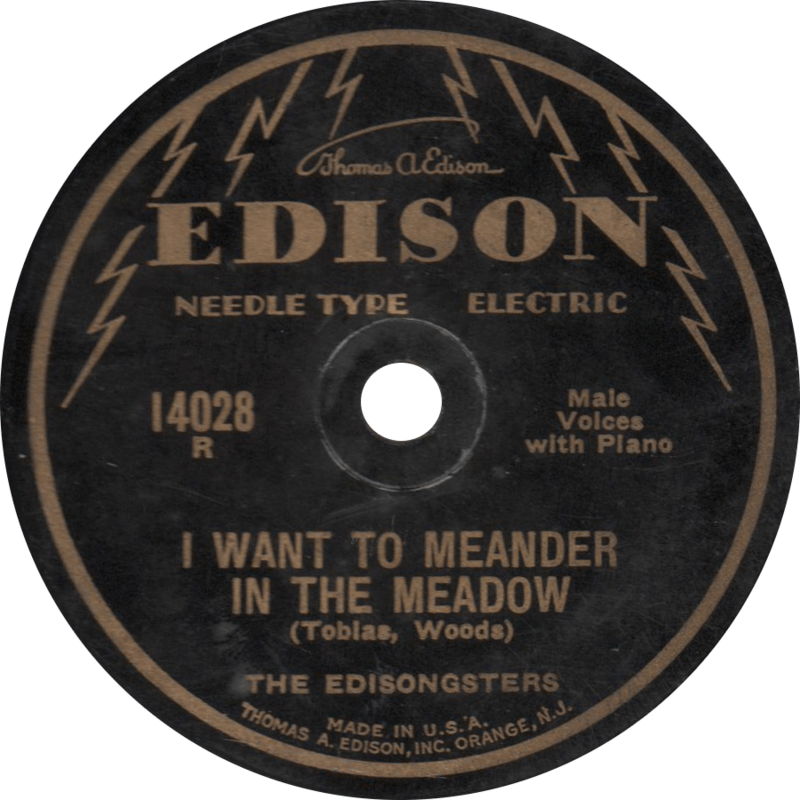 I Want to Meander in the Meadow, recorded 1929 by the Edisongsters.